I love fireworks. New Year fireworks, Australia Day fireworks, Guy Fawkes fireworks – you name it – and I will be dreaming to watch them live. Dreaming. That is it. 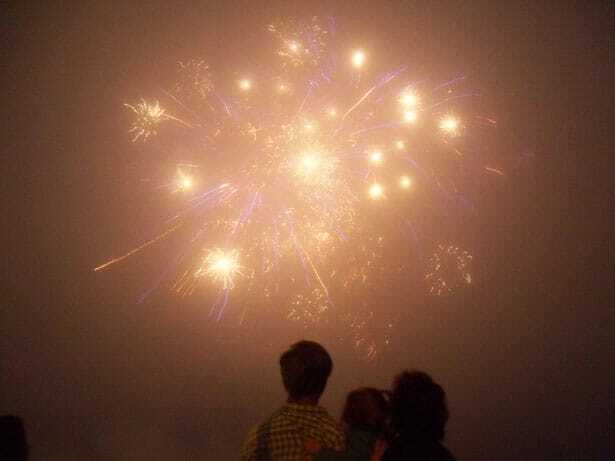 As for many suburban dwellers, the strong desire to awe at the fireworks collides with the cruel reality. ten-minute show requires spending two hours in public transport or facing driving / parking nightmare with an alternative to spend half of the night trying to catch a taxi. With our infamous public transport, no matter how hard you plan, you can miss the show. I did miss Sydney Christmas fireworks – with the train being just 15 minutes late, I came to Sydney Harbour in time to hear it, but not to see it. Big gatherings are not for everyone. Many people feel the stress of being in the middle of the crowd. Quite often, we celebrate New Year with friends, and we end up even further from all these firework places, than we would normally be. Luckily, there are more options to watch fireworks than from Sydney Harbour or Melbourne’s Federation Square. You can watch the show away from crowds on a boat cruise or from the rooftop restaurant. You can make your research and find a place a bit further away from the show, but still offering decent views. You may even be lucky enough to have friends living in the apartment featuring a balcony with a proper vantage point. Many local councils offer fireworks in the parks or on the shore, maybe less spectacular, but more family friendly, and closer to your home. However, if all the above options are not for you, there is a solution that will bring your beloved fireworks closer to you. It is an outdoor cinema system. Connect it to the set top box and watch major Australian fireworks live no matter where you are. Forget the comfort of your sofa. It is an outdoor event! You can bring the experience of the real fireworks to your backyard or to the camping grounds, with picnic rugs or foldable chairs, surrounded by the fresh night air. You can even share the experience with your neighbours – even the smallest screen is enough for 50 guests, while a four-metre system will be sufficient for 250 people! The good quality sound system makes your heart beat in awe, as if you were in the middle of the actual event! Overall, outdoor home theatre can bring many fireworks to your doorstep, with no need to travel – great option for families with children, for the inhabitants of outer suburbs or small towns, and for the lovers of comfort and good night sleep.